Whenever family members ask about good toys for children, one of the first that comes to mind is blocks. Unit blocks – blocks that come in several sizes and shapes that are proportional – offer tremendous learning opportunities. As they play, children solve problems and develop motor skills. They measure, sort, compare, think about shapes, and develop spatial skills. In order to successfully realize their ideas, children develop the capacity to plan and to use their past experiences to inform their building designs. Children learn to practice and persist as they cope with design challenges. They explore scientific principles and physics as they experience the challenges building their structures pose, whether it’s making a long bridge, creating a window opening, or building higher. Even taking blocks off the shelf and cleaning up offers opportunities for learning. When children match a picture of a block to the block itself at cleanup, they are “reading the blocks” – using an abstract representation of the block to know where to put it. This is an important prerequisite to reading words. Many children are also developing stories and pretend skills as they build. The buildings may be part of a city, or may represent a neighborhood where children live. There may be people who live and work in the buildings that are constructed. 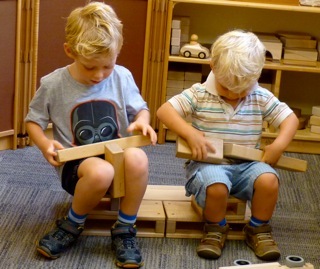 Children may explore jobs people do, road or pipe works, and relate their block play to their life experiences. There are many opportunities to develop social skills as children build as well. A bigger structure or thematic plan is possible when children work together, but to do so requires talking together, planning, sharing ideas, negotiating, taking turns, and generally learning to take the perspective of others. Many different kinds of construction toys, including unit blocks, encourage children to create and solve problems. Because open-ended materials like blocks can be used and combined in so many ways, children are invited to expand their capacity for divergent thinking. Free exploratory play with blocks and construction toys is important, but is not the only way that these materials can be used. More experienced children may benefit from following a plan to build, or by solving a problem with blocks posed by a teacher. Constructing with blocks gives children opportunities to learn as young children learn best – through physical activity with concrete materials in their environment, on themes that are personally meaningful, and in an integrated way. Enjoy the collection of constructions shown by these photos! This entry was posted in Curriculum, Education, Play and tagged curriculum, education, kindergarten, learning, preschool on January 10, 2016 by Katrina Selawsky.